Lots of progress this week! I am so excited! I love it already! Colleen managed to come to Neenah this weekend. She had a slight lull between her exams at the Vet School @ UW Madison. She wanted to see the progress in the house building. I had gushed to her over the phone about how great it was. She couldn't stand it and came to visit. We hit the Winterland Parade of Homes in the Appleton/Neenah area. It reminded me of how many other decisions I need to make before this project is done; but I got some great ideas. By the time we were finished, it was snowing hard, and we braved the snowstorm so that Colleen could see the house. In the picture, I am standing on the snow covered second floor of the house. There is the opening for a large window behind me. It will be a window in the landing of the stairwell. After studying the house plans on paper for so long, its amazing to see it being built in 3D. I love the way it is turning out! So far, its not feeling too huge to me--despite the many remarks that I have heard after people have viewed my plans and tell me "Your house is so huge!". . I think it will have a cozy feeling to it, and it will be good for entertaining. I was really glad Colleen came home.. It was very nice to share the experience with someone who would call it home too. I had gone over to the house earlier in the week towards evening by myself. The first floor walls were partially up. I was equally excited then as well, but I had no one to share it with. Its an odd feeling for me at times when I ponder the fact that I am doing this huge project alone and I wistfully wish my husband was here to share it with. I am working extra hours for my employer in order to help pay the expenses of the house. I worked a 12 hour shift at the Fast Care clinic which is in Appleton in Shopko. It was really busy and I was tired when I was driving home on Friday night. It was about 9 pm, and I suddenly saw those red and blue lights again in my rear view mirror! I inwardly groaned. I was thinking, "I blogged about it and now I am attracting it to myself!" I was driving down Cecil Ave. in Neenah. It was the same street I was talking about in the previous blog when my nieces called me a speed demon. When the policeman shined his flashlight in my face, I could see a surprised look of recognition in his face. He said "Oh, Hello!". I said, " Do I know you?" (With surprise in my voice. Except for social things, one doesn't exactly want to be recognized by the police). Then he asked, "Are you a twin?". "No", I replied, "I'm a triplet". It turned out that he knew my sister, Kathleen, one of my triplet sisters. She helped start a charter school in Neenah, and his children go there. We also established, in our short conversion, that he had seen me at the clinic in Neenah. This was going better than I expected. Two points in my favor! I still pleaded with heaven while he was in his car looking me up on his computer. (One of my husband's favorite sayings was "There are no atheists in the foxhole". I think that was originally said by General McArthur). Well, I was in my own foxhole, and once again grateful when the police officer came back to my car window and passed me a pink "verbal"warning ticket. I thanked him profusely. The other police officer from a couple of weeks ago had given me a true verbal warning, no pink ticket. This time I moved up to the pink slip. Obviously, I realize that I am moving closer to a real ticket if I am not careful. Any helpful hints from those of you who never get speeding tickets would be helpful. For the moment, however, I was saved once again! The speeding ticket event caused me to ponder: What is the meaning of it all? I learned this from my friend, Lauri Lumby, who sees metaphors for the overall Big Picture of Life in its small, everyday happenings. Check out her blog at http://yourspiritualtruth.com/. Did this have any metaphorical meaning for my life? Why was I sudddenly getting speeding tickets again? Was I going too fast in my life? Well, in going to the parade of homes and talking with a couple of people, I came to the realization that maybe I was going too fast. The attempt to get the house completed in the next 8 weeks for the parade of homes at the end of April is very stressful for me. So I talked with Jamey about it. I asked if I could possibly opt for being in the fall parade of homes. I let him know my fears and concerns. "Its a house! We need to build it slowly, steadily and not rush it.I don't want all the contractors rushing to complete it by a certain deadline and then cut corners and make mistakes. I don't want to feel pressured to make decisions in a couple of days when maybe I will need a week or two, all because of a deadline." Jamey, who could have a second career as a psychologist in my book, was very understanding and echoed my feelings. He understands my point of view and sees some merit in it. So, he is going ponder it as well. He will reassess the progress in a couple of weeks and make a decision then as to whether he should withdraw it as an entry to the Parade of Homes in April. He's the builder, so I will leave it up to him. For the uninitiated, it seems like an enormous task to complete in such a short amount of time. 2/28/11 update: Its official. Jamey talked with his wife Billie Jo. They agree that the pressure would be too much and get the best of them. Plus, they want me to be able to make decisions calmly. Colleen was in an uproar this morning over this and gave me a phone call. She wants a house! She doesn't want me to wait. Well, I asked Jamey an important question. "Can we use the toilet when the house is completed and we are waiting for the parade of homes?" He was confused by the question, but said "Uh, Yes." This was good news. This means we can hang out at the lake on Sunday afternoons in the summer! We can still have cook outs on the grill! We can live outside, just not inside. We can put up a tent and look at the house with fondness! Lumber that will be used in building the house is FSC (Forest Stewardship Council) certified: meaning that the lumber is obtained from a responsibly managed forest. FSC certified forests are grown and managed in a way that protects water quality and wildlife habitat. Once the trees are cut, they are promptly replanted. Not all lumber companies carry this type of lumber, so have your builder check. Ours was obtained from Torborg's Lumber in Waupaca, WI. With projects like a house, I prefer a slow and steady kind of pace. I can tell, however, that with this house project there will be a mad dash to the finish in the next couple of months. The foundation was laid at the end of December, and there was a long pause between then and now; appoximately 2 months. OK...so there was a lot of snow and subzero temperatures and Jamey was finishing another house. As more than one person has said to me, "Is this going to a be an extreme home makeover project (they do those in a week)"? I am beginning to think so. The goal is a house that is ready for the Spring parade of homes during the last week of April. I am trying to avoid an ulcer by affirming that I am not in control, and surrundering the project to a Higher Power. Jamey is cool, calm and collected and does not seem concerned that we have only 2 months to build a large, and what looks to me to be, a rather complicated house. As they say in my yoga class, "BREATHE". Progress has been made over the last few days, however, as you will see from the pictures. There is hope in my heart that the walls will be up soon. My preference for slowness in house building contrasts with my speed on the road. My neices were in the car behind me the other day. They gleefully told me when they got home (I live with them) that I was "speed demon". Their dad, Jeff, was happy that I was providing entertainment for them during the drive, as they made commentary about my speed while I went ahead of them and beat them home. The other day, too, I was driving to a conference in LaCrosse. I was on a lonely stretch of road on Hwy. 21 and was absentmindedly listening to NPR and driving along until I saw those somewhat familiar red and blue flashing lights in my rear view mirror. Its the only time in my life that I feel like a criminal. I am an otherwise model citizen. 2 weeks prior to this, I had just purchased new car insurance. I had been proud of myself, when I signed up for it, that it had been over a year since I had gotten a speeding ticket (probably because I only have to drive a few miles to go to work now). "Is there a reason you were speeding today?" he said. "No," I said sheepishly. In the past, when I was a midwife, I occasionally had a legitimate reason for going fast, such as getting to a delivery. "Do you know how fast you were going?" "Ummm, no. Unfortunately, I was not paying attention." (I usually try the honest route.) "Well, it was 68 miles per hour. You are supposed to be going 55 miles per hour." So I handed over my license and insurance card to the state police officer. My heart sank at the thought of getting an expensive speeding ticket when I have all these other expenses to pay for in building my new house, and, so soon after starting with a new insurance company. I sent a fervent prayer heavenward that I would be spared and forgiven. He came back, handed back the license, and said "I am just going to give you a verbal warning this time." I replied with overwhelming gratitude in my voice, "Thank you, officer, I will put on my cruise control now." Whew! It felt so good to be spared. I am betting we'll need to be over the speed limit to finish up on this house project though! After a 9 month hiatus from having a house on itself, the ground was broken to begin a new house on December 20, 2010. The next day, in the midst of my busy schedule at work, Jamey called to tell me that the house would sit up higher than they originally planned because of the lay of the land, and the fact that they had hit some bedrock on the southern side of the house. "Did I mind having a driveway that would slope up?" he asked. Actually, I did mind and I wasn't completely understanding the things he was trying to describe to me over the phone. So, I ran down there on my lunch break, and trudged through the snow to view what was happening. It was exciting but stressful! Finally the house building process was actually beginning! The foundation was all laid out and they had this enormous machine pouring gravel into the foundation: they were pouring the footings. Guys in overalls and thick jackets were busy doing their work--a very masculine atmosphere, I might add. I wondered why they couldn't just dig deeper or move the house forward but there were various reasons why it couldn't be done. I made the fastest decision on the house up to that point when I decided to forego the zero entry garage. With a zero entry garage, there is no step up into the house from the garage door entry. It is flat. This is a great option for handicap accessibility, which I wanted not only for myself when I am old and gray, but for anyone visiting who would need that option. I highly recommend it if you can do it. However, in order to do it, they raise up the garage floor about 18" so that it is even with the entry way. I decided to lower the garage floor to the conventional height, so that the driveway would not have to be as steep; it will still slope up where it used to be flat, but it won't be quite as high as it would have been with a zero entry. I have decided that I have been living out the concepts of "Who Moved the Cheese? ", a book about adapting to change. I was totally not ready to have the elevation of the house change, but it did, and I have had to adapt to it. I am hoping that there is some cosmic purpose to it, like saving me from a flood in the distant future. The other change I had to adapt to was the location of my property line. For 20 years, I thought my property line was the bottom of a swell in the land between my neighbor and I. In fact, I always assumed they had less footage on the water than my property. Chas, the architect, had insisted that I get a survey of the land and have stakes placed on the property line before the building would begin. Lo and behold, it turned out that my old house was built right on the property line, not 10 feet away like I thought. Aaaargh! For whatever reason (mostly because change is hard), I had a hard time acceptting that. I tried calling the county to get them to grandfather me in, since the old house had been there so long, but they said I had little chance of success even if I did appeal it. So I learned to accept it. It turns out that my neighbor and I have exactly the same amount of footage on the water...I was taking care of part of his yard for all of those years!. Fortunately, a recent change in our town's zoning law stipulates that the house only has to be 7 feet off of the propery line. That was important to me since on the opposite side of my house I abutt up against a wooded lot line and don't have much wiggle room to get around the house. I will have to do some landscaping to create a path around the house on its wooded side. Anyway, after quite a few blog posts, there are finally pictures of the new house going up! The infamous sloped driveway I posted about! Its Valentine's Day. A day for occasional pangs of sadness when everyone around you has received flowers from their sweethearts and husbands. No Valentine's Day roses for me this year. I stared at a picture of Rory, and softly said, "I miss you,". He had a talent for writing sweet, flowery words in cards expressing his love for me. He wasn't big on actual flowers. His usual response was, "They die so quickly...its a waste of money." To which I would respond, "They're so beautiful though!" He'd occasionally break down and get me flowers. The above picture were roses given to me by Rory on the last Valentine's Day we had together in 2009--I finally trained him! We would have had a million arguments over the house project, I am sure, since we were opposites in many ways. It certainly would have been completed by now if he was in charge. I must admit that although its been challenging to make all the decisions myself, there has been a freedom in it, too, which has been refreshing. All things have a way of growing. The house project just keeps on growing. In the beginning, the details and the decisions were maddening and driving me crazy. Now that I am getting closer to a finished product, it is feeling therapeutic. Or perhaps its me that is changing. Perhaps, I am just becoming more sane. Perhaps, being in the midst of grief, and feeling that life was full of havoc, it became so. Two things were really challenging at the start. Coming up with a final plan took major work for me. I looked at hundreds of plans. Then I talked with Jamey who would give my suggestions to a designer at the lumber company he worked with. After going back and forth on the design at least 10 or 15 times, and ending up with roof that seemed out of proportion with the house, I asked myself the question, "Why I am designing this house? I have never designed a house before!" It was January. I had been working on the plan for the house for about 3 months. About that time, I went out with one of my friends, Christine Arendt, who had built a house in Neenah a couple of years ago. She had used Befhoff homes as her builder, who is a premier green builder in the area http://www.berhoffhomes.com/). They also do solar panels which I was interested in. So I talked with them and they highly recommended a very experienced architect, Chas Reuter. He was great. He has an amazing amount of experience and skill. He added in design elements that I never would have considered, but look wonderful. He was very accomodating when I wanted to make changes. Chas had made up a couple of designs for me and I was having a hard time choosing between them. On a whim, I found a Feng Shui consultant while visiting my daughter in Madison one weekend. Her name was Jackie Patricia. (website: jackie@jackiepatricia.com ). She had a lovely fragrant and peaceful home. Instead of helping me choose between my 2 plans, she said I needed a major redesign. I was missing several corners or areas that she felt were important, such as the wealth and relationship corners. I was like, "Oh, my God! Chas is going to think I am stark raving mad! How do I begin to tell him this?" I neglected to realize that he has "heard it all" in his many years of experience, and he hardly batted an eye. (Instead there were some dollar signs there!) Really, he was completely understanding. I was so grateful for that. I thought he might have a lot of ego involved in his own design and might be offended when I wanted to change it. He didn't. It did cost money to make those changes, though! So here's the rub. Designing with the builder would have been no more than $1000 to $1500. If I had gone with the first plans of the architect, it probably would have cost about $2500-$3000 total. Instead, because I made numerous changes, it cost $5930 (I checked with Chas on the amount!). I felt I had a lot of input though, and I would do it again. Every time I show my plans, I get a compliment on them. Architects have a great sense of design. If you are going to build a home that you plan to live in for a long time, go with an architect. I finally finished the house plans in November, so it took about a year before they were done. The other challenging thing in the beginning, was that there was a sort of bidding war between Berhoff homes and Gallery homes. I learned alot about how to read a bid and what to expect in the bid itself, as a result. It was so hard to choose between them! Berhoff is really known for their green building expertise; and Jamey is an excellent craftsman. Ultimately, I chose Jamey because he was from Oshkosh, and I had dealt with him the longest. He had done a lot of work for free, including all the design work early on, getting the house torn down, and getting the large trough out of the old house. I wanted to give him a chance to build a green home. Plus, he wanted to use the house as a parade home which is helping me to get better prices on things. Chas, the architect, is old school: he hand draws his plans). His webiste is http://www.chasreuter.com/ Below are some photos of the plans. You can see why my family calls it Neilsen Manor! 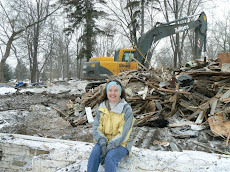 D-Day (destruction day) for the old house was February 15, 2010. Mother nature produced weather that was befitting of saying good bye. It was gloomy, foggy, and it was snowing. 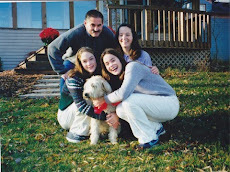 Caroline was able to be with me (Colleen was busy with Vet school in Madison). We shed some tears as we took a final walk through the house...now missing windows doors, piping, sinks, and furniture. There were large holes in the walls. The remains of the blinds on the windows that were left were hanging askew. Snow had drifted through the open windows and onto the floors. We rescued a cherished poetry book of Rory's called the Vagabound's House that somehow got left behind. So many memories, so many stories those walls held. Our good friend and neighbor, Mary Wrasse, was there too. Mary was the first neighbor to come over when we first moved in, casserole in hand, and with a big smile on her face. She acted as a grandmotherly figure to Caroline and Colleen as they grew up. They often went over there after school where she would have cookies ready for them. Eventually, her daughter and son in law, Katie and Pat Grasley, purchased her house, tore it down and rebuilt a beautiful home. When we needed to warm up during the tear down process, we went over to the Grasley home. As we waited for things to happen, Mary laughingly told stories of the original owner of our house. The bay our house was situated on is named after the owner. It is called Streich's Bay. The Streich brothers lived out on the point of the land sticking out from the bay, until one winter, after an argument, Chuck Streich got mad and moved his house across the ice to its present location. It started out as a small cottage, and grew as the years went by. There are the remains of old wooden wagon wheels lining the south side of our property. This was the business of the Streich family. They made wagon wheels. Chuck Streich used them to mark the property line. After the Streich family, a a couple of other families, in their turn, moved in. One of them added the large garage and grew worms in there...worms that were sent to places like UW Madison that used them in experiments. We moved into the property during August of 1990. We had moved from the Chicago area. We had rented a house there, unable to find a property that we could afford. We considered it a near miracle to be able to buy a home on a lake on 3/4 of acre for about $94,000. We did a lot of work to the old house, too, while we were there, but I was ready for a transformation. With the Grasley's home as an example of what can be done when you build new, Caroline and I said good bye to the old house. Jamey and his crew did their final preparations. This included Jamey's making a hole in the roof and pulling out an old trough, probably close to 100 years old. He said it looked like the roof had been flat at one time and they used the trough to collect rain water. When it came time to add the current roof, for some reason they just build over the trough rather than remove it. This is what we had seen when we would peek up into our attic--we were never quite sure what it was, but now it came out into the daylight, the first time in many, many years. I plan to save the trough, and will probably use it to collect rainwater again. I also made them save some of the foundation stone and will use it in some landscaping. The landfill sorts out anything that can be recycled. All the wood gets chipped.